It really is sad to see this landmark tree getting cut down. 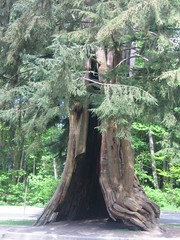 There was a unanimous decision by the Vancouver Park Board commissioners to have this tree cut down. We all probably have a photo with this tree whether we’re local born and bred Vancouverites or visitors or new transplants. It belongs with the many other trees in the world as being the most photographed. Unfortunately after the big storm in 2006 that was the straw that broke the camel’s back. It has become unsafe and the decision has been made to bring it down in May. So get down there soon to get your last looks at it standing and photographs with this natural beauty. Not all is lost, they will be preserving this tree after bringing it down as well as erecting a monument in it’s place. I’m actually really happy they’re not erecting a metal cage around it (which was the other option) and I think it should definitely be returned to nature. Yes, that makes sense. Let’s take the most unique parts of the park and demolish them. I mean, after all, where else would we fit a Burger King? > erecting a monument in it’s place.